"1926 general strike" redirects here. For Bangalore, see 1926 Binny Mills strike. The 1926 general strike in the United Kingdom was a general strike that lasted nine days, from 3 May 1926 to 12 May 1926. It was called by the General Council of the Trades Union Congress (TUC) in an unsuccessful attempt to force the British government to act to prevent wage reduction and worsening conditions for 1.2 million locked-out coal miners. Some 1.7 million workers went out, especially in transport and heavy industry. The government was prepared and enlisted middle class volunteers to maintain essential services. There was little violence and the TUC gave up in defeat. Though nine days in, the TUC leadership knew 'the government could hold out longer than the workers', it was perceived at the time as a 'brilliant failure'. According to a leading TUC researcher, Walter Milne-Bailey, 'There has never been a more amazing display of labour solidarity and the effect of such a demonstration must inevitably be deep and enduring. Workers have learnt a new sense of their oneness and their power.' In the 1929 general election, the Labour Party won more seats than any other party in Parliament for the first time in its history. The First World War: The heavy domestic use of coal in the war meant that rich seams were depleted. Britain exported less coal in the war than it would have done in peacetime, allowing other countries to fill the gap. The United States, Poland and Germany and their strong coal industries benefited, in particular. Coal production was at its lowest ebb. Annual output per man had fallen to just 199 tonnes in 1920–1924, from 247 tonnes in the four years before the war, and a peak of 310 tons in the early 1880s. Total coal output had been falling since 1914. The fall in coal prices resulting from the 1924 Dawes Plan. It allowed Germany to re-enter the international coal market by exporting "free coal" to France and Italy, as part of their reparations for the First World War. The reintroduction of the gold standard in 1925 by Winston Churchill, which made the British pound too strong for effective exporting to take place from Britain and (because of the economic processes involved in maintaining a strong currency) raised interest rates, hurting some businesses. Mine owners wanted to maintain profits even during times of economic instability, which often took the form of wage reductions for miners in their employment. Coupled with the prospect of longer working hours, the industry was thrown into disarray. Miners' pay had lowered from £6.00 to £3.90 over seven years. Mine owners announced that their intention was to reduce miners' wages. The Miners Federation of Great Britain rejected the terms: "Not a penny off the pay, not a minute on the day." 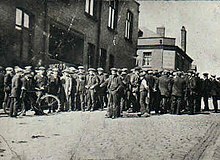 The Trades Union Congress responded to the news by promising to support the miners in their dispute. The Conservative government, under Stanley Baldwin, decided to intervene by declaring that a nine-month subsidy would be provided to maintain the miners' wages and that a Royal Commission, under the chairmanship of Sir Herbert Samuel, would look into the problems of the mining industry and consider its impact on other industries, families and organisations dependent on coal supplies industry. The Samuel Commission published a report on 10 March 1926 recommending that national agreements, the nationalisation of royalties and sweeping reorganisation and improvement should be considered for the mining industry. It also recommended a reduction by 13.5% of miners' wages, along with the withdrawal of the government subsidy. Two weeks later, the prime minister announced that the government would accept the report if other parties also did. A previous royal commission, the Sankey Commission, had recommended nationalisation a few years earlier to deal with the problems of productivity and profitability in the industry, but Prime Minister Lloyd George rejected the report. After the Samuel Commission's report, the mine owners declared that miners would be offered new terms of employment, which included lengthening the work day and reducing wages depending on various factors. The Miners' Federation of Great Britain refused the wage reduction and regional negotiation. The final negotiations began on 1 May but failed to achieve an agreement, leading to an announcement by the TUC that a general strike "in defence of miners' wages and hours" was to begin on 3 May, a Monday, at one minute to midnight. The leaders of the British Labour Party were unhappy about the proposed general strike because they were aware of the revolutionary elements within the union movement and of the damage that the association would do to the party's new reputation as a party of government. During the next two days, frantic efforts were made to reach an agreement between the government and the mining industry representatives. However, they failed, mainly because  of an eleventh-hour decision by printers of the Daily Mail to refuse to print an editorial ("For King and Country") condemning the general strike. They objected to the following passage: "A general strike is not an industrial dispute. It is a revolutionary move which can only succeed by destroying the government and subverting the rights and liberties of the people". Baldwin was now concerned about the TUC and printers' action interfering with the freedom of the press. King George V tried to stabilise the situation and create balance saying, "Try living on their wages before you judge them." The TUC feared that an all-out general strike would bring revolutionary elements to the fore and limited the participants to railwaymen, transport workers, printers, dockers, ironworkers and steelworkers, as they were regarded as pivotal in the dispute. The government had been preparing for the strike over the nine months in which it had provided a subsidy by creating organisations such as the Organisation for the Maintenance of Supplies, and it did whatever it could to keep the country moving. It rallied support by emphasizing the revolutionary nature of the strikers. The armed forces and volunteer workers helped maintain basic services. It used the Emergency Powers Act 1920 to maintain essential supplies. On 4 May 1926, the number of strikers was about 1.5–1.75 million. There were strikers "from John o' Groats to Land's End". The' reaction to the strike call was immediate and overwhelming and surprised both the government and the TUC; the latter not being in control of the strike. On this first day, there were no major initiatives and no dramatic events except for the nation's transport being at a standstill. On 5 May 1926, both sides gave their views. 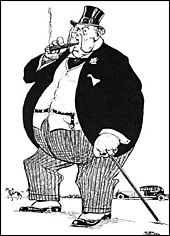 Churchill (at that time Chancellor of the Exchequer) commented as editor of the government newspaper British Gazette: "I do not agree that the TUC have as much right as the Government to publish their side of the case and to exhort their followers to continue action. It is a very much more difficult task to feed the nation than it is to wreck it". Baldwin wrote, "The general strike is a challenge to the parliament and is the road to anarchy". The British Worker, the TUC's newspaper, wrote: "We are not making war on the people. We are anxious that the ordinary members of the public shall not be penalized for the unpatriotic conduct of the mine owners and the government". In the meantime, the government put in place a "militia" of special constables called the Organisation for the Maintenance of Supplies (OMS) of volunteers to maintain order in the street. A special constable said: "It was not difficult to understand the strikers' attitude toward us. After a few days I found my sympathy with them rather than with the employers. For one thing, I had never realized the appalling poverty which existed. If I had been aware of all the facts, I should not have joined up as a special constable". It was decided that Fascists would not be allowed to enlist in the OMS without first giving up their political beliefs, as the government feared a right-wing backlash so the fascists formed the so-called "Q Division" under Rotha Lintorn-Orman to combat the strikers. On 6 May 1926, there was a change of atmosphere. The government newspaper, British Gazette, suggested that means of transport began to improve with volunteers and strikebreakers, stating on the front page that there were '200 buses on the streets'. They were, however, figures of propaganda, as there were in fact only 86 buses running. On 7 May 1926, the TUC met with Samuel and worked out a set of proposals designed to end the dispute. The Miners' Federation rejected the proposals. The British Worker was increasingly difficult to operate, as Churchill had requisitioned the bulk of the supply of the paper's newsprint so it reduced its size from eight pages to four. In the meantime, the government took action to protect the men who decided to return to work. On 8 May 1926, there was a dramatic moment on the London Docks. Lorries were protected by the army. They broke the picket line and transported food to Hyde Park. That showed that the government was in greater control of the situation. It was also a measure of Baldwin's rationalism, in place of Churchill's more reactionary stance. Churchill had wanted, in a move that could have proved unnecessarily antagonistic to the strikers, to arm the soldiers. Baldwin, however, had insisted otherwise. On 11 May 1926, the Flying Scotsman was derailed by strikers near Newcastle upon Tyne. The British Worker, alarmed at the fears of the General Council of the TUC that there was to be a mass drift back to work, claimed: "The number of strikers has not diminished; it is increasing. There are more workers out today than there have been at any moment since the strike began". However, the National Sailors' and Firemen's Union applied for an injunction in the Chancery Division of the High Court to enjoin the General-Secretary of its Tower Hill branch from calling its members out on strike. Mr Justice Astbury granted the injunction by ruling that no trade dispute could exist between the TUC and "the government of the nation" and that except for the strike in the coal industry, the general strike was not protected by Trade Disputes Act 1906. In addition, he ruled that the strike in the plaintiff union had been called in contravention of its own rules. As a result, the unions involved became liable, by common law, for incitement to breach of contract and faced potential sequestration of their assets by employers. 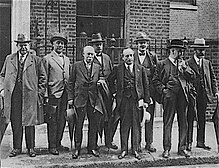 On 12 May 1926, the TUC General Council visited 10 Downing Street to announce its decision to call off the strike if the proposals worked out by the Samuel Commission were respected and the government offered a guarantee there would be no victimization of strikers. The government stated that it had "no power to compel employers to take back every man who had been on strike". However, the TUC agreed to end the dispute without such an agreement. The miners maintained resistance for a few months before being forced, by their own economic needs, to return to the mines. By the end of November, most miners were back at work. However, many remained unemployed for many years. Those still employed were forced to accept longer hours, lower wages and district wage agreements. The strikers felt that they had achieved nothing. The effect on British coal mines was profound. By the late 1930s, employment in mining had fallen by more than a third from its pre-strike peak of 1.2 million miners, but productivity had rebounded from under 200 tons produced per miner, to over 300 tons by the outbreak of the Second World War. The split in the miners that resulted from Spencerism and the agreement of the Nottinghamshire miners to return to work, against the policy of the Miners' Federation of Great Britain divided the coal miners as a national bargaining force until the establishment of the National Union of Mineworkers. The Trade Disputes and Trade Unions Act 1927 banned sympathy strikes and mass picketing, and created a system whereby trade union members had to 'opt-in' to paying the political levy to the Labour Party. In the long run, there was little impact on trade union activity or industrial relations. The TUC and the trade union movement remained intact and did not change their basic policies. Keith Laybourn says that historians mostly agree that "In no significant way could the General Strike be considered a turning point or watershed in British industrial history." It was the only general strike in British history, as union leaders such as Ernest Bevin, who had coordinated the strike, considered it a mistake. They decided that action by political parties was a better solution. However, the country came close to a one-day general strike on 31 July 1972. over the imprisonment of the Pentonville Five. The poet Hugh MacDiarmid composed an ultimately pessimistic lyrical response to the general strike, which he incorporated into his long modernist poem of the same year, "A Drunk Man Looks at the Thistle". His imagistic depiction of how events unfolded occurs in the extended passage beginning "I saw a rose come loupin oot..." (line 1119). Harold Heslop's 1929 novel The Gate of a Strange Field is set during the Strike, and described the events from the viewpoint of striking miners. Ellen Wilkinson's 1929 novel Clash focuses on a woman activist's involvement with the Strike. The strike functions as the "endpiece" of the satirical novel, The Apes of God, by Wyndham Lewis. In that novel, the half-hearted nature of the strike, and its eventual collapse, represents the political and moral stagnation of 1920s Britain. In James Hilton's 1934 novel Goodbye, Mr. Chips, the retired schoolmaster Chipping calls the strike "a very fine advertisement" since there was "not a life lost" and "not a shot fired". The failure of the strike inspired Idris Davies to write "Bells of Rhymney" (published 1938), which Pete Seeger made into the song "The Bells of Rhymney" (recorded 1958). In the 1945 novel, Brideshead Revisited, the main character, Charles Ryder, returns from France to London to fight against the workers on strike. The LWT series, Upstairs, Downstairs, devoted an episode entitled "The Nine Days Wonder" (Series Five, episode 9; original airing date, 2 November 1975) to the general strike. The strike is referred to in several episodes of the BBC sitcom You Rang M'Lord?. In the 1970s and 80s, "Strikes 1926" was a short-lived restaurant chain in London. The interiors of the restaurants were decorated with photographs from the strike. Touchstone, a 2007 novel by Laurie R. King, is set in the final weeks before the strike. The issues and factions involved, and an attempt to forestall the strike are key plot points. A BBC series entitled The House of Eliott included an episode depicting the general strike. In the novel Any Human Heart by William Boyd the protagonist Logan Mountstuart volunteers himself as a special constable in the 1926 general strike. Robert Rae's 2012 film The Happy Lands is set amongst coal miners in Fife during the 1926 strike. The fourth part of Ken Loach's film tetralogy Days of Hope is devoted to the General Strike. In the alternate history short story If the General Strike Had Succeeded by Ronald Knox contained in the anthology If It Had Happened Otherwise, the story is in the form of an article from The Times of 1931, which describes a Great Britain under communist rule. The strike is constantly mentioned in David Peace's book GB84, in which the older characters often mention the 1926 strike to draw parallels with the long miners' strike of 1984-5. The fourth series of the BBC2 television show Peaky Blinders is set in the period immediately prior to and during the General Strike, emphasising the involvement of revolutionary communist elements. ^ Eric Hopkins 'Industrialisation and Society', p.206. ^ "Forgotten (or conveniently forgotten) reason for 1926 miners strike recalled – Dr Fred Starr | Claverton Group". Claverton-energy.com. Retrieved 28 August 2010. ^ David Sinclair, Two Georges: The Making of the Modern Monarchy. London: Hodder and Stoughton, 1988. p. 105. ^ "Nottinghamshire NUM Area History". Nottinghamshireexminer.com. Archived from the original on 14 July 2011. Retrieved 28 August 2010. ^ Patrick, Renshaw (1975). Nine days in May: the general strike. Taylor & Francis. ^ "The Legality of the General Strike in England," A. L. Goodhart The Yale Law Journal, Vol. 36, No. 4 (February 1927), pp. 464–485 Published by: The Yale Law Journal Company, Inc.
^ Mathias, The First Industrial Nation, pg. 449. ^ Whyles, Stephen (12 September 2014). A Scab is no Son of Mine. Xlibris Corporation. p. 4. ISBN 9781499089585. Retrieved 3 April 2015. ^ teacher),, Thomas, Jo (History. Oxford AQA history A level and AS component 2. Wars and welfare : Britain in transition, 1906-1957. Willis, Michael, 1950-, Waller Sally,. Oxford. ISBN 9780198354598. OCLC 953454036. ^ Keith Laybourn (1993). The General Strike of 1926. Manchester UP. p. 103. ^ J. Graham Jones, "Ernest Bevin and the General Strike", Llafur: Journal of Welsh Labour History/Cylchgrawn Hanes Llafur Cymru (2001) 8#2 pp 97–103. Ferrall, Charles, and Dougal McNeill, eds. Writing the 1926 General Strike: Literature, Culture, Politics (Cambridge University Press, 2015). Hattersley, Roy. Borrowed Time: The Story of Britain Between the Wars (2008) pp 115–42. Mowat, Charles Loch. Britain between the wars: 1918-1940 (1955) pp 284–338, A non-partisan account. Saltzman, Rachelle Hope. A Lark for the Sake of Their Country: The 1926 General Strike Volunteers in Folklore and Memory. Manchester University Press, 2012. Saltzman, Rachelle H. "Public Displays, Play, and Power: The 1926 General Strike." Southern Folklore: Façade Performances (Special Issue) (1995) 52(2):161-186. The 1975 BBC series Days of Hope depicts events that led up to the 1926 strike. Wikimedia Commons has media related to 1926 United Kingdom general strike. General Strike 1926 at Sheffield City Council. A socialist analysis of the strike by the Socialist Party of England and Wales General Secretary, Peter Taaffe.